Support requests can be submitted: by phone and in writing via the form on our website. 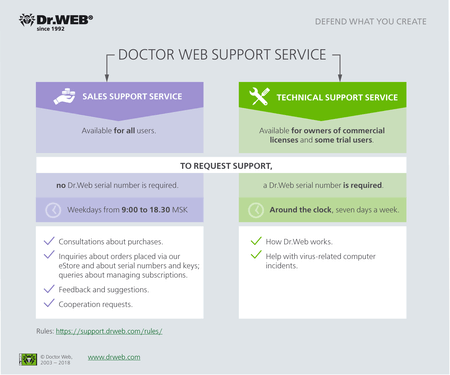 The history of written support requests is stored on Doctor Web's site, but only if customers sign in to the support request form via their My Dr.Web Portal or via their account on Doctor Web’s site. We ask that you respect our telephone support specialist’s recommendation to make a written request. In cases when, for example, you require calculations for a complex license or your question concerns an incident involving Dr.Web’s operation, it is simply impossible to provide technical support by phone. Your license’s serial number and registered email address. If you’ve lost your serial number, you can recover it online. If you’ve forgotten your registered email address, register your serial number again — an email containing the key file will be sent to your registered address. OR the Avangate order number or a copy of the purchase confirmation email if you bought Dr.Web on Doctor Web's site. You can find this number in the email the store sent you or in your personal account area at www.avangate.com. OR the order number and Gmail address if you bought Dr.Web via Google Play. OR a scanned copy of the license certificate from a box. OR a copy of the cash receipt with the serial number printed on it. If your support request relates to unlocking the Anti-theft or recovering a Dr.Web for Android account, you will be asked to submit these documents. If you cannot provide us with documents confirming that your license was acquired legally, we will not be able to help you and will have to decline (close) your request. Sales support specialists provide consulting services by phone and via the web form on workdays from 9:00 to 18:00 MSK. Requests received from Dr.Web users are processed first. Doctor Web usually processes written requests within 1 hour of submission. The maximum response time for requests submitted with a license number or an Avangate order number is 12 hours. Help future and current Dr.Web users with purchases, migration, renewals, and additional purchases; assist with choosing a service supplier. Issue invoices for purchases of Dr.Web certified versions. Process Dr.Web user requests related to non-technical problems with keys (erroneous purchases, searches for lost licenses, email address recovery, and the unlocking of pirated licenses (only for business users), replacement, splitting, merging, and returns related to duplicate auto renewals). Process Dr.Web Anti-virus service user payment- and subscription-management-related requests. Process requests related to feedback and suggestions about how the Doctor Web site and the services it offers are working and how the Dr.Web software is operating (such requests are forwarded to the profile specialists in the Dr.Web product development department). Inquiries about collaborating with Doctor Web. If you contact the sales support service as a Dr.Web user, submit your serial number, subscription ID, and Avangate or GPA order number. This will significantly accelerate the processing of your request. If, in the course of communicating with a sales support specialist, you have a technical question (about Dr.Web’s operation or a virus incident that occurred on PCs protected by Dr.Web), create a new request. If you are communicating with a sales support specialist in writing, your request related to commercial issues will be closed, and you will be prompted to create a request for the technical support service. Technical support specialists provide consulting services 24/7 by phone and via the web form. Process requests related to Dr.Web’s operation. Process requests related to Dr.Web operational incidents, including technical problems experienced during the registration process. Consult on Dr.Web's features and the idiosyncrasies of its use. Provide assistance with virus-related computer incidents (VCIs), including assistance with decrypting files corrupted by encryption ransomware. Technical support specialists DO NOT PROVIDE CONSULTING SERVICES on the use of third-party software (non-Dr.Web products). The response time for written requests is no more than 48 hours. Doctor Web usually processes requests within 2 hours of submission. Under extreme workload conditions, our specialists usually process requests within 48 hours of submission. Owners of expired commercial licenses. Owners of a 1-month trial for home use or a 14-day trial for mobile devices. Users of free products (Dr.Web CureIt!, Dr.Web LiveDisk, and Dr.Web for Android Light). Users of free licenses (e.g., those won at auctions). Users who have no a license or have pirated licenses. Requests submitted by these users about technical questions will be closed, and they will be prompted to use the self-support services available on Doctor Web's site. These users can contact the sales support service on issues that are within the scope of responsibility of our sales support specialists. The terms for paid VIP support are stipulated in special agreements with customers. To get acquainted with the terms and conditions for VIP support, contact our sales support service.